Early last spring I ordered yarn from Peace Fleece for a sweater for myself and asked my son what his sweater for this winter should be like. “It should have Totoro on it,” he said. And so I contemplated how to make him a sweater which would look nice without the Totoros on it (in case he changed his mind) and how to construct it. I ended up deciding to knit the Seamless Saddle Shoulder sweater from Barbara Walker’s Knitting from the Top. The sweater has set in sleeves that are knit as you go, which makes it fit well. The instructions in here are not step by step, but are infinitely adjustable. Chibi Totoro and Chu Totoro are shy. Big Totoro is not so shy. I made it as a cardigan, with a V-neck. The body edging is single crochet, including the button bands and bottom edge. I made up how to do the pockets. 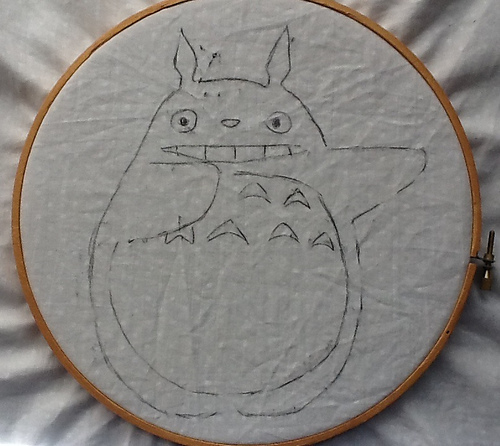 The Totoros themselves were a challenge. I was originally planning to do them in duplicate stitch. 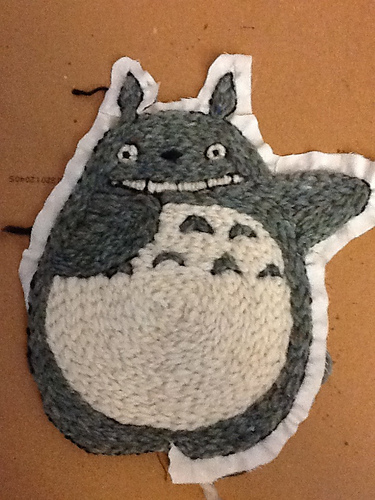 However, my stitches were large enough that the Totoros would not have been recognizable, just blobby and pixellated. 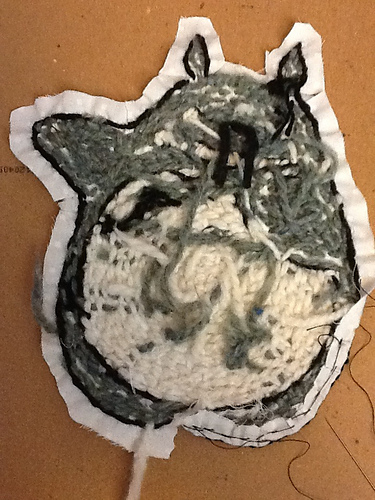 My next plan was to embroider directly on the knitting, but the fabric didn’t seem stable enough for an embroidery base. My third thought was to crochet them separately and then sew them on, but I was having trouble again with the stitch size being too long. Finally, I remembered how nice chain stitch embroidery can look as an appliqué, and did a test run with Chibi Totoro (the smallest). Success! Chibi Totoro is the shyest of the three, and I was pleased at how well that came across. 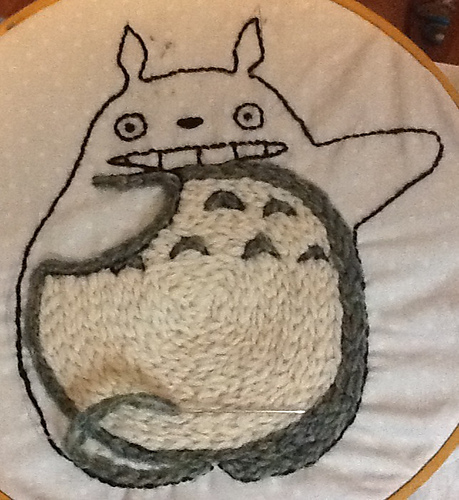 You can see with Chu Totoro that I was embroidering with wool yarn on cotton fabric. I used some pieces of old sheet that would otherwise have become rags. 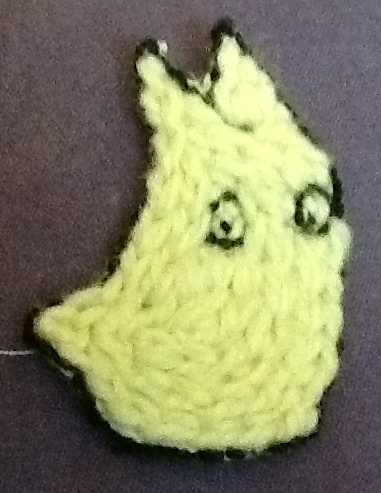 The next step was to use some thin black yarn I had around to make the outlines; for that I used back stitch. 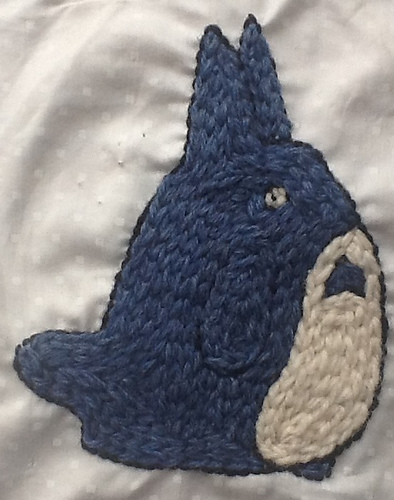 Then I filled in the space in between with chain stitch (mostly); there were a few places I used satin stitch (teeth, and the space between his mouth and arm to delineate the shapes) or just random stitches (the whites of his eyes). At this point I kind of felt like he was emerging from the fog or something. Maybe it’s that Cheshire Cat grin? Once I was done embroidering, I trimmed to about 3/16 of an inch from the edge, clipped the curves, and turned the hem allowance under. I tacked the hem allowance in place with sewing thread. And here’s what the back looks like. Messy, eh? So you can see the edge being tacked in place. Finally, I consulted with the wearer of the sweater as to placement and sewed them down with whipstitch. What a fabulous sweater! I have to say, the pictures don’t quite do it justice. Its really one of the most creative and cheerful knitted works I’ve seen. Thank you for posting such great instructions. Thank you! Yeah, my camera’s not in the best shape at the moment or I’d have managed better. Photos of it being worn are in the next post, which you might like better! This is awesome. Yet another project showing your undeniable creativity! Thank you! I bet you could take the idea and run with it!